Today was a special day for some of our former patients. This was the day they were presented to the public in Newport, Oregon at the Oregon Coastal Aquarium. We at REGI are glowing with pride at the photos that demonstrate their "perfect behavior" on this important day. By all accounts both staff and the public were delighted with the birds. Their story started in the summer of 2008 in Central WI. Some young boys found a Turkey Vulture nest. Somehow two tiny Turkey Vulture Chicks ended up in the boys bedroom. The boys parents didn't discover the "secret" in the bedroom for a week or so. 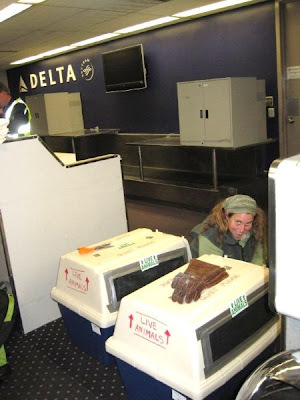 We were called and soon the tiny balls of down were patients at REGI. The diet the boys provided to the baby vultures was bread rather than the meat and bone young vultures need. They suffered serious nutritional deficiency. The Turkey Vulture chicks were raised at REGI, but due to their delicate condition when admitted, they required additional handling and care. We were not able to put them with foster parents to be raised. Sadly, the chicks became imprinted to humans. They would never be able to be released to the wild. The next best option was placement in an educational facility. We are very selective about where our former patients are placed. 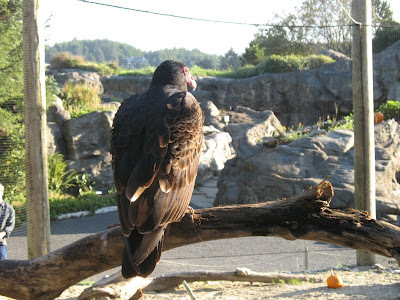 We were pleased when we received a call this spring from CJ McCarty the Curator of Birds at the Oregon Coastal Aquarium inquiring about our young Turkey Vultures. We agreed the Aquarium was a fine placement. 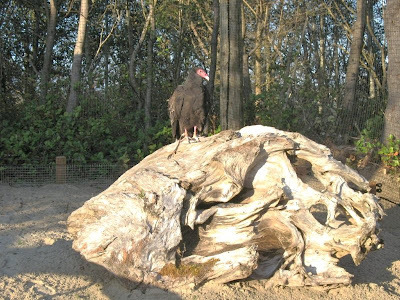 With the decision made, work began on the aquarium's Turkey Vulture exhibit. 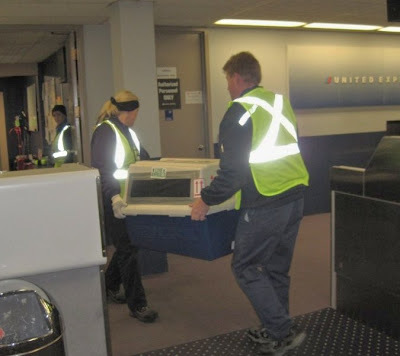 CJ flew to Wisconsin in early October and spent five days with us at REGI. She learned everything she could about the vultures from how to handle them to the key to their very individual personalities. She wanted them to feel comfortable with her. THAT is the sign of an excellent curator. 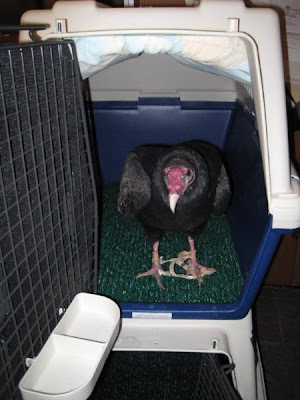 We were already pleased with the facility but after meeting CJ we were thrilled and confident the Turkey Vulture chicks we cared for and grew so fond of would have a wonderful forever home. Our Turkey Vulture kids have a great new home and an adoring public. We could not be happier. One more thing, tonight the vultures are still being called "A" and "B", but tomorrow they will have real names after the results of a naming contest are revealed. There is a great video and article in the Oregonian Click here for the news coverage.